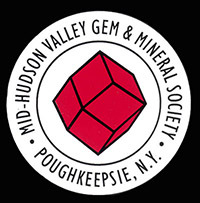 Welcome to the website for the Mid-Hudson Valley Gem & Mineral Society, based in Poughkeepsie, NY. We are a society for people who love rocks, gems, fossils, field collecting, jewelry-making, and general earth science--people known as "rockhounds." We have been around since 1969. More information can be found in the "About Us" pages. Facebook members can visit our Facebook page here. We hold monthly meetings on the third Friday of the month in Poughkeepsie where we often have a speaker on a subject of interest. All general meetings are open to the public, but we of course hope you will decide to join our society. More information about meetings and benefits of joining can be found in the "Membership/Meeting" pages. Every year we organize a gem & mineral show where dealers in specimens, equipment, and jewelry come to sell their pieces. More information can be found under "Annual Show." We are also dedicated to earth science education. More information can be found under the "Education" section of this website. We donate to activities and groups that promote earth science education and are, ourselves, willing to provide demonstrations and talks on the subject to groups such as classrooms and scouting groups. Please feel free to contact members under the "Contact Us" section of this website. If you are interested in joining or attending a meeting, find out what the current meeting topic is under the "Membership/Meeting" section.